Color:42mm Black + Green Color:42mm Black + Green 2018 New DesignSix months later, we carefully designed a beautiful strap for apple watch. It is soft and close to the skin, breathable, easy to wear and disassemble. Suit for apple watch Series 3/ 2 /1, Nike+, Hermès,Edition. 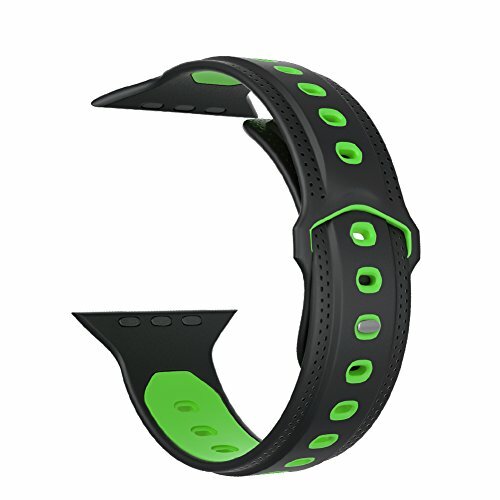 Product Features:*Customize your apple watch with fully adjustable silicone sport bands designed specifically for apple watch. *Made with 100% smooth durable silicone for a soft and comfortable fit. *Apple watch wrist strap lugs on both ends for precise and secure installation. *An innovative pin-and-tuck closure ensures a clean fit and adjusts to fit small and large wrists. *No hassle, super easy to remove the old one and replace with this one. NOTE: This is not an original apple watch band, it is a third party band.Please contact us first when you have any problem,we will give you the best service and solve the problem ASAP.Thank you so much.